It’s hard to say enough good things about Rovio’s furious catapult game, Angry Birds [iPhone: 99¢ / Free – iPad: $4.99]. 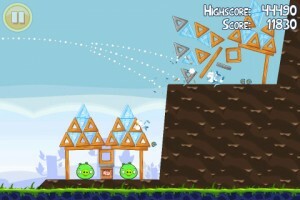 The game is set in a surprisingly cute game world where smug green pigs steal the eggs of a band of nearby birds. Naturally, this makes the birds very angry. They then decide the best way to get revenge on the pigs is by loading themselves up in catapults and slamming in to the pig fortress that makes up each of the included levels. The previous update added a bunch of new levels, and this latest update not only packs even more levels in to the mix but also a brand new bird with a special ability that sends it flying backwards like a boomerang for massive pig mayhem. New block types are included that make up the pig defenses including a mattress to bounce off of. There’s a new graphical theme, even more achievements, and in the level select screen there are two “coming soon" buttons, indicating even more new levels coming in the future. We loved Angry Birds in our review, and since then the game has only gotten better and better with updates. I’ve played through Angry Birds in its entirety on my iPhone, and again on my iPad, and really can’t recommend this game enough especially with all of these updates.